ALAMEDA and PALO ALTO, Calif. (June 13, 2018) -- Golf's participation has certainly slowed down from it's peak. The game was particularly hard-hit by the "Great Recession" of 2008 and 2009. Courses closed, destination resorts suffered, and many people declared the game to be on life support. Just don't tell that to the 26 million golfers who teed it up at least once in 2017, most of them at public courses where you don't have to be a millionaire to afford the greens fee. The most affordable places to play golf are municipally owned courses. And the trend by the USGA to use them to host major championships proves the value of classic "muni" layouts like San Diego's Torrey Pines or Long Island's Bethpage Black. In San Francisco, the historic Harding Park golf course was re-established as a PGA Tour worthy venue. A campaign to save it by former USGA president Sandy Tatum was a resounding success. Now, for a fairly reasonable fee, (especially so for San Francisco residents) you can play the same course that hosted the President's Cup, and that will host the 2020 PGA Championship. And while the two new Northern California courses opening in early summer of 2018 don't expect to host any majors, they both host historic amateur tournaments. Both Baylands Golf Links in Palo Alto and Corica Park (in Alameda) will, no doubt, be popular charity and buddy tournament venues. They are examples of public golf done right - walkable, environmentally-friendly venues that will be fun to play. Let's look at both of them. An amazing new course is opening in the middle of one of the most populated areas of California, with a greens fee that's affordable by all. I suggest you make a tee time. The City of Alameda hired Greenway Golf to manage their historic golf facilities back in 2012. A vision was formulated, with the centerpiece being an Australian Sandbelt style course that would be playable in even the most severe drought or rainy season. Famed golf architect Rees Jones (you may know him as the "Open Doctor") in collaboration with Greenway Golf Chief Agromomist Marc Logan have created a public golf masterpiece. The new South Course will be one of the nation’s most environmentally friendly public facilities, while offering golfers an affordable chance to experience design elements of the renowned courses of Logan’s home country Australia, like Royal Melbourne and Kingston Heath. Jones’ vision was to provide golfers ample landing areas off the tee, and a variety of ways to approach any green. Even shorter hitters will be rewarded with a short birdie putt if they use their imagination to roll their approach shots through the contoured openings in front of most greens. A well-honed “ground game” will save strokes on shorter shots around the green as well. The engineering team led by Logan used the most high tech irrigation and drainage systems. Most of the work done won't be seen by the golfer, because it's all under foot. But what golfers will appreciate is the course's readiness regardless of what California's weather extremes dish out. Drought-tolerant strains of Bermuda grass on the fairways reduce the amount of water required, while closely-mown areas around the greens and "run-up" ramps will give Corica Park an old school design aesthetic not previously seen in the Golden State. Today’s golf executives shy away from discussions of “signature holes.” But Greenway Golf’s CEO George Kelley -- a former Australian Tour player -- loves a short par-4, and there are several on the South Course that have him beaming, especially the 8th. "It's easy to design a great long hole," he said. "But it's really hard to design a great short one. I think this is one we'll all be really proud of." South Course architect Rees Jones was receptive to ideas about the new design. When Kelley pointed out spots he thought a bunker made sense, Jones agreed and designed them in. "If you get in them," joked Jones to Kelley during an early course walkthrough, "it's your fault, not mine." Palo Alto, California is known for it's location right in the heart of the social media frenzy, and for being the home of Mark Zuckerberg and Stanford University. The Facebook founder is No. 4 on the Forbes list of richest people, and a full 20 years younger than his nearest competitor, Jeff Bezos of Amazon. (But we don't hear much about his golf game.) Palo Alto has some of the priciest real estate in the world, which makes it even more important to provide parks and open space. The restoration of the former Palo Alto Golf Course was necessitated by the need to rebuild levees on the San Francisquito River, which was a major engineering endeavor. The process started in 2012, and residents and locals who were without their beloved course waited patiently for its reopening. They won't be disappointed. The architect chosen was Forrest Richardson & Associates of Phoenix, Arizona. 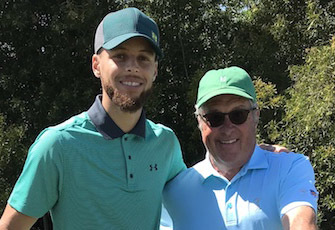 Richardson is very familiar with Bay Area courses, having redesigned the layout of the former Mira Vista Country Club, which has since been properly re-named back to it's original moniker, Berkeley Country Club. The fact that social media giant Facebook's headquarters is in nearby Menlo Park was not lost on Baylands G.L. architect Forrest Richardson. "Golf is the ultimate social game," remarked Richardson at the course's grand opening. "We hope that a younger generation of golfer will be encouraged to come out here and play." The new layout is certainly setup for a social experience. Carts are not required -- it's fairly flat and doesn't have long distances between holes. The layout is bordered by 55 acres of wetlands, but if a player is smart off the tee it's fairly easy to avoid walks through the tall grass on every hole to hunt for balls. The entire layout is very scenic. You'll especially want to stop and enjoy the view from the 5th green. From it's elevated location you can look back at the rest of the course below. Sunsets from here will be gorgeous and ever-changing if you're catching a late day nine. And since the 1st and 10th tees start from the clubhouse you will have choices and not get stuck in the middle of the course if you run out of daylight. Fans of architecture will appreciate Richardson's choices. A driveable par-4 (No. 7) and another hole with an alternate green. Another two holes share the same large green. This is fun stuff, a nod to the links courses of the past. Because Richardson, and the City of Palo Alto, want you coming back. It's a social game - bring your family or a date. [Editor's note] Baylands Golf Links is the home of the Palo Alto City Championship.